US President Donald Trump on Friday emphasized his country's past and continued interest in the Asia-Pacific region at a meeting of world leaders anxious about what turn US policy might take under his leadership. "We will be friends, partners and allies for a long time to come," Trump told the Asia-Pacific Economic Cooperation (APEC) CEO summit in the Vietnamese city of Da Nang. Trump praised the economic progress made in what he called the "Indo-Pacific" region as "nothing short of miraculous." "I am here to offer renewed friendship with America," Trump said. The term "Indo-Pacific" has been interpreted as an indication of Trump's wish to stress India's importance in the region. Read more: Will Putin and Trump meet at APEC? But he added that the US would insist in future on "robust" trade deals based on "fairness and reciprocity," saying his country had often come off worst in the past. He called for private enterprise to take the leading role in making such deals, criticizing governments for excessive intervention, such as currency manipulation. Trump reiterated his firmly held view that the US had not been treated fairly by the World Trade Organization, saying it had often suffered at the hands of countries that did not abide by WTO principles. He also said that America would no longer enter into large-scale trade pacts that he said disadvantaged his country, preferring instead bilateral trade agreements. One of his first acts as president was to withdraw the US from the Trans-Pacific Partnership (TPP) trade deal, turning his back on the so-called "Asia pivot" policy favored by his predecessor, Barack Obama, who wanted to bolster US influence in the region as a counterbalance to China. The remaining 11 potential partners are trying to salvage what remains of the deal on the sidelines of the APEC summit in Vietnam. Japan's economy minister, Toshimitsu Motegi, said late on Thursday that an agreement in principle had been made to forge ahead without the US, but his words were later contradicted by Canada's foreign trade minister, Francois-Philippe Champagne. APEC brings together heads of governments from across the Pacific Rim to discuss economic issues. APEC's members are Australia, Brunei, Canada, Chile, China, Hong Kong, Indonesia, Japan, South Korea, Malaysia, Mexico, New Zealand, Papua New Guinea, Peru, Philippines, Russia, Singapore, Taiwan, Thailand, the US and Vietnam. Going into the meeting there was much speculation as to whether Trump would meet on the sidelines with his Russian counterpart, Vladimir Putin. 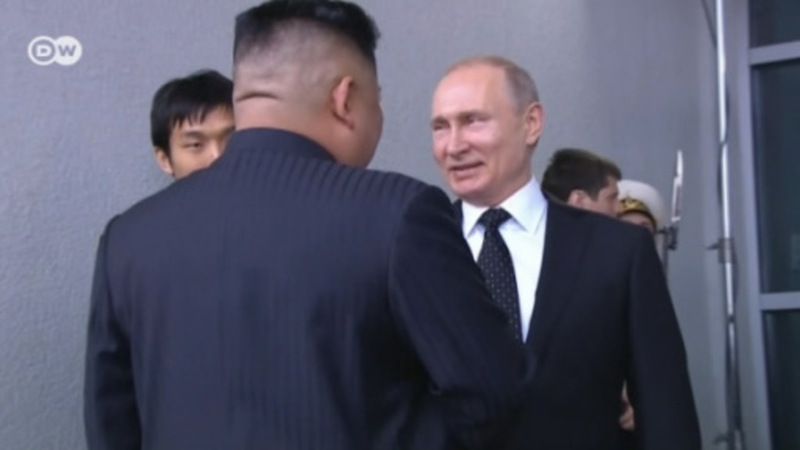 In the end there was no meeting, only a brief handshake and a shared smile. Trump is on an 11-day Asia trip, his first as president, that has previously taken him to Japan, South Korea and China. During Trump's two-day visit to China, Trump and Chinese President Xi Jinping announced trade deals between their countries supposedly worth over $250 billion (€223 billion). The largest agreement struck was an $83.7 billion investment by the China Energy Investment Corp, to take place over a 20-year period, in chemical manufacturing projects and shale gas developments in West Virginia. However, many of the agreements are non-binding memorandums of understanding rather than legal contracts. In South Korea, a main issue was the nuclear threat posed by North Korea, with Trump warning Pyongyang that he was prepared to use the "full range" of military power to defend the US and its allies.